You awake, blurry eyed on the cobbled streets of your little old town, immediately aware of nothing but a quiet buzzing in your head. Looking up from your lopsided position on the cold hard stones of the road, you see two people you recognise as your good friends Jason and Lauren. But they are not how you remember them, an image flashes up in your mind's eye of the three of you drinking in the tavern last Friday, all happy and cheering as you took turns to chug down your drinks- Wait was it last Friday, it doesn't feel that long ago, what happened over the weekend, what did you do...? You strain, causing the buzzing to get louder, forcing your mind to remember but alas the memories of those days seem to have deserted your conscious self. Although none of that matters now, you look over to the limp, lifeless bodies of your old friends, covered in blood and ragged claw marks. What could have done this, what kind of monster could have so violently ended the lives of your friends...? How dare they... How very dare they… A warm tear runs down your cheek, as your ears pick up at the distant sound of shouting and the harsh sounds of cold wind blowing down the street and up against your bare skin. You, however, do not feel cold even laying outside, naked in late autumn. In fact you feel warm, hot even, like you are in the wild throws of a fever but with an otherwise clear head. You get to your feet, clumsily, looking around for wherever your clothes went or perhaps someone who was willing to go get the guards and lead the search for whoever killed your friends. But you see nothing, nothing but the quaint houses and cobbled streets of your little old town on which lay the bodies of your old friends Jason and Lauren. Even in the far off distance which seems a lot clearer then you ever remember it looking before, you see nothing- hang on, was that... it is, a some what disorganised group of guards heading this way! You call out to them asking for help but all you hear back is shouts of "Monster! There it is! Kill it!" on the wind. As you hear this something animalistic clicks in your brain and you turn and flee,instinctively, from the encroaching danger as the buzzing in your head gets louder and louder, it's sort of, you think to yourself, starting to resemble a growl. 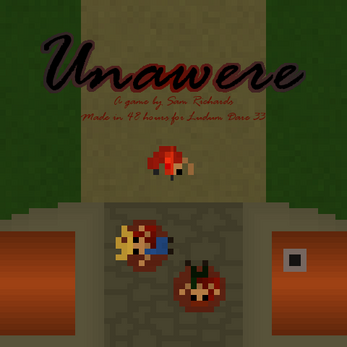 Unawere is a game made in 48 hours for Ludum Dare 33 based on the theme "You are the Monster". 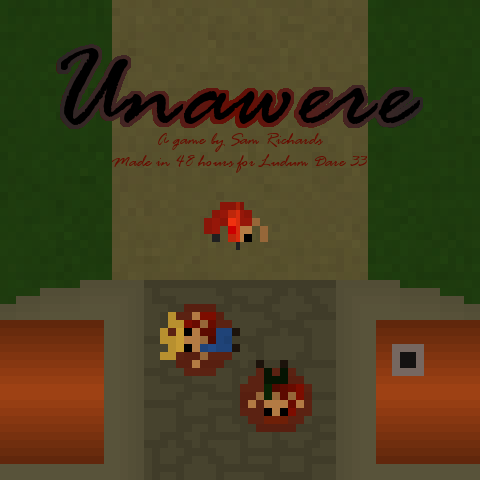 In Unawere you play as a woman who has lycanthropy, this means that she turns into a wolf when angered. Unfortunately this has led to her unwarily killing some members of her town and now that she has been deemed a monster she must flee the town guards into the forest. In human form you gain Rage when you either shove away a guard or they attack you. Once your Rage bar reaches full you will change to wolf form, in which you can kill guards with a couple of attacks. You will also regenerate health for the duration of your Rage however you will quickly calm down back to human form. 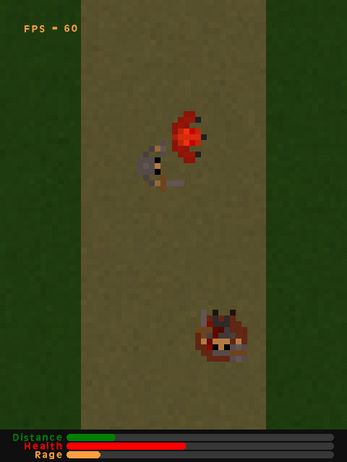 Guards will damage you with every attack, you can push them away in human form or kill them in wolf form while regenerating some health but if you drop to zero health you will lose. 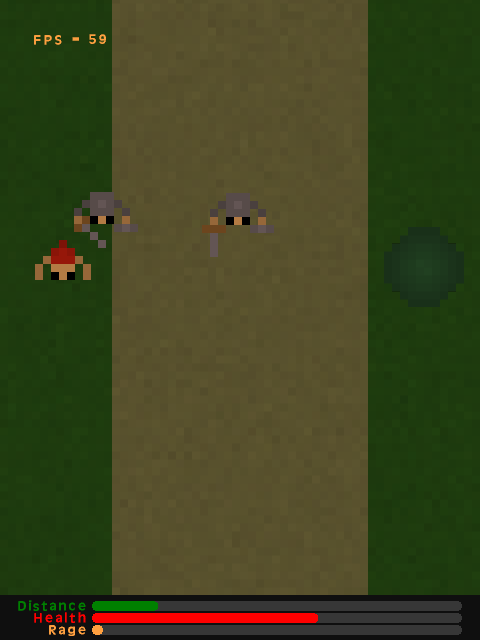 To win you need to move away from the town until the Distance meter is full, signalling that you are far enough from the town for them to give up the chase.